Rockville Centre has an extensive history, and today, more than 25,000 individuals live throughout this unique area. While many new buildings have taken over Rockville Centre, a number of historic buildings still stand today as a way to pay homage to the past. One of the historic buildings in question is located at 45 North Village Avenue, which used to be home to the South Shore Trust Company. 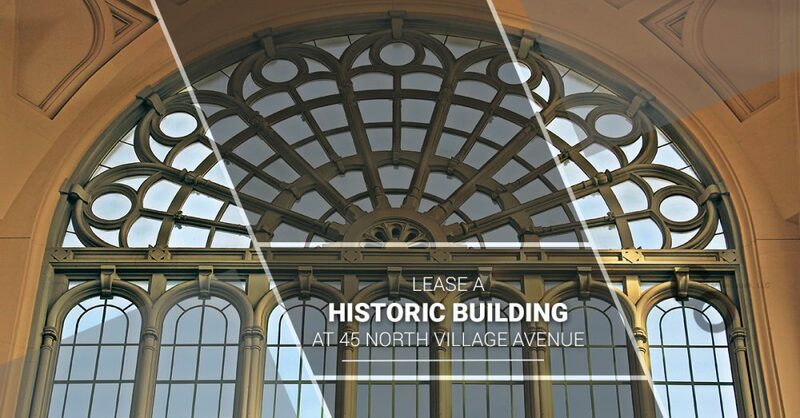 Today, this historic building is available for lease, which is why we will be talking more about what you stand to gain from leasing the space at 45 North Village Avenue in Rockville Centre, New York. At Chart Organization, LLC., we are more than just the top company for finding commercial, retail, and residential property available for lease in your area. Our goal is to provide the most in value for every property that we lease, so that we can help both ourselves and our leasees succeed while creating a meaningful relationship during the process. If you are thinking about leasing office space in Rockville Centre, New York, learn why you should consider viewing 45 North Village Avenue today. The building at 45 North Village Avenue was originally used by the South Shore Trust Company in the late 1920s. In fact, in 1929, George W. Loft, a member of the United States House of Representatives, founded the South Shore Trust Company and placed his newfound company at this unique location. The historic building at 45 North Village Avenue has maintained its original look and feel, as it features two identical columns on both sides of its ornately decorated entryway. For this reason, if you are looking for an office for rent that stands out from surrounding storefronts while offering a unique and aesthetic flair, 45 North Village Avenue is perfect for your needs. It is no secret that ample foot traffic is essential to the success of any storefront. Failing to secure space for rent in a highly-trafficked area could result in your business suffering, ultimately impacting your bottom line. However, at 45 North Village Avenue, you will never have to worry about a lack of passers by in your area. In fact, 45 North Village Avenue is located incredibly close to the Long Island Rail Road as well as a number of nearby bus stops. So, if you’re wanting to attract as many potential customers or clients to your business as possible, 45 North Village Avenue is the perfect location for your needs. We hope that you enjoyed this brief summary of 45 North Village Avenue! If you are interested in learning more about this historic building that is available for rent, get in touch with our team of experts now at Chart Organization, LLC. We know that you may have a number of questions regarding this unique property, which is why we are always available to address any concerns that you may have. Visit our website today to view more details about 45 North Village Avenue as well as our other properties available for rent!